Identification: L. littorea is 1.6-3.8 cm high ("Littorina littorea" IUCN). 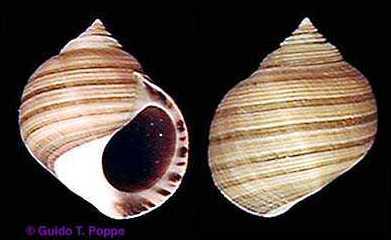 The shell of L. littorea is sharply conical with a pointed apex and surface sculpturing. The smooth shell color ranges from grey-black-brown-red but is generally black or dark grey-brown, and is usually patterned with darker spiral lines. The central axis of the shell is typically white and the animal is recognizable in its juvenile stages by the transverse black barring of the tentacles which are rather flat and broad. Original Distribution: L. littorea can be found along most intertidal rocky coasts of Great Britain. It is also distributed along the coasts of Ireland and on the eastern Atlantic Coast from Northern Spain to the White Sea. Current Distribution: L.littorea can be found within the rocky coastline, estuaries and marine habitats of Nova Scotia and New Brunswick in Canada. In addition it is also found is similar ecosystems throughout New England and Mid-Atlantic states. Site and Date of Introduction: L. littorea was introduced from Europe it was first reported in Canada in 1840. During the increase in shipping in the 19th century the gastropod spread to the United States. The species reached the coast of Maine in 1870 and by 1888 it reached as far south as Cape May, New Jersey ("Littorina littorea" Clark). Mode(s) of Introduction: L. littorea was accidentally brought from Europe to Canada through ballast water of ships. A second possibility is that the species was brought over for food as it is eaten in many parts of Europe. From there L. littorea spread south to the United States through the shipping business. Within 18 years the species spread through the whole New England coast and in a second introduction into Maryland and Delaware, L.littorea spread throughout the whole Atlantic coast of those states ("Littorina littorea" Clark). Few reports have noted its spread south of Maryland. Reason(s) Why it has Become Established: Due to the ability of L. littorea to exist in a variety of conditions it has been able to spread along rocky coastlines at a fast rate. L. littorea is inhabits all except the most exposed intertidal areas; from the upper shore into the sub littoral zones. In sheltered conditions it can also be found in sandy or muddy habitats such as estuaries and mud flats. The species is also fairly tolerant of brackish water. The preferential food for L. littorea is highly available along most of the Northeastern coast of North America enabling this spread. .
Ecological Role: L. littorea is an important part of the rocky intertidal ecosystem. L. littorea is a dominant herbivore and an important macro-algal grazer that competes with many local species in both New England and Canada ("Littorina littorea" IUCN). Once they have come out of the water column as adults they are significant grazers upon juvenile algae also trying to establish in the zone. It feeds on Ente romorpha, Ulva, and Porphyra and also diatoms. Benefit(s): L. littorea has been shown to reduce the growth of the non-native Ulva lactuca from dominating the intertidal zone in Massachusetts. By doing so, native species of seaweed have been able to out compete U. lactuca for space and nutrients. It has also been suggested that L. littorea can be a highly suitable bio-indicator species for contamination of the marine environment ("Littorina littorea" IUCN). Many behavioral changes of this species have been correlated with changes in trace elements and compounds in the water. L.littorea can be used to detect such changes that might threaten other species, including humans. Threat(s): L. littorea has drastically altered the New England intertidal community structure by allowing slow growing Chondrus crispus to overtake faster growing green algal species ("Littorina littorea" IUCN). By feeding off of other species of seaweed L.littorea allows the growth of C.crispus when it would otherwise could not become dominant. While not common, some locations where L.littorea are present have experienced a complete transfer of multiple algal species to a monoculture of C. crispus. The invasion of L .littorea has also brought the marine black spot disease. This disease caused by a parasitic worm results in black spots on infected fish, and has caused a lot of damage to local fisheries. L.littorea acts as the first host for the disease, which it transfered when the infected individual is eaten by fish. This disease also affects birds. Control Level Diagnosis: While L. littorea has spread widely along the coasts of North America this species should be considered medium priority. L. littorea has become an important part in the ecology of rocky intertidal shores. Through a rapid increase in numbers L. littorea has out competed many similar gastropods for space, a limited resource in the intertidal zone. 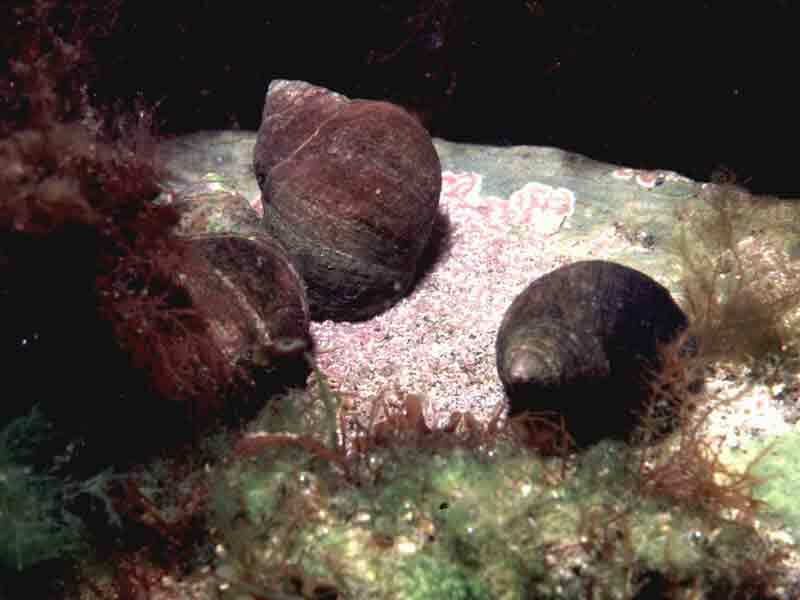 L. littorea has allowed for the growth of Chondrus crispus but L. littorea has also benefit the ecosystem by controlling the introduced Ulva lactuca. Control Method: There have been few methods of control for L. littorea. Current eradication ideas for a similar species Littorina saxatilis in the San Francisco Bay involve biocides, manual eradication and the use of bio-controls. However, little has been done in the way of eradication and or research for the removal of L. littorea. A main point of concern involves the study of ways to avoid a reintroduction of the species.